This is one of those salads that is easy to make with whatever ingredients you have. It also tastes great with mixed greens instead of kale. The measurements are approximate depending on what you have and the flavor you'd like. I enjoy the combination of flavors...primarily sour, sweet, salty (and spicy depending on how much garlic you use). The dressing: measurements are approximate. I just try to make sure I can taste all the flavors. 1. Squeeze the juice of the lime onto chopped kale with salt (generous) and massage kale. Let it sit for about 15 minutes to an hour or so before adding the rest of the dressing and salad ingredients. 4. Let it sit for at least 15 minutes before serving. Sometimes a few hours helps infuse the flavors together. Arugula is a nutritious green that has a spicy, almost peppery flavor. It's slightly bitter flavor stimulates digestion as well. It tastes great dressed with something sweet like balsamic fig vinegar or many other variations. Go ahead and try one of these great combinations or make your own! To a bowl of freshly washed baby arugula leaves, I add one of these combinations and toss with the balsamic dressing. This salad is a versatile adaptation from a salad I made in one of my whole foods cooking classes while studying Naturopathic Medicine at Bastyr University. The trick to getting the Kale soft and tasty without cooking it is massaging it while wet with salt and letting it sit before adding the other ingredients. 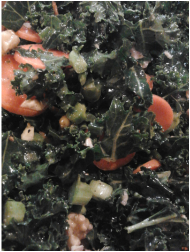 Kale is deliciously crunchy and very nutritious! Kale is especially high in Vitamin A, K and C as are many leafy greens. I've made many versions of this salad with a variety of vegetables and nuts and I rarely measure the dressing but just taste as I go, adapting to that day's taste buds. Prep Time: 20 minutes. However, make this salad a few hours at least before eating it. It tastes better if its allowed time to "marinate". 1/2 - 2 cups Chopped Nuts: I often use walnuts, sesame seeds, sunflower seeds, pumpkin seeds or all of them mixed together (raw or toasted work fine). Chop the kale (including stems) fairly small and wash it. While the kale is still wet, place it in the salad bowl, sprinkle it with salt (1-2 tsp) and massage and squeeze the salt into the kale for a few minutes. Mixing the dressing: First mix the two oils and add the chopped garlic. If you have the time, wait a few minutes or more for the garlic to infuse into the oil before adding the vinegar/citrus, salt/soy sauce, pepper and ginger. Mix well before tossing the salad at the end (step 7). 1. Heat up the grill while you are preparing veggies. Turn down head to medium-low once it is hot. 2. Slice the vegetables as described above. Set aside romaine halves and tomatoes to put on the grill last. 3. Put the rest of the veggies in a large, shallow dish to toss with olive oil, salt, pepper, garlic and Italian seasoning if you’d like. 4. Grill the veggies and bacon. Thickest ones in the hottest areas of grill. Keep an eye on them so if they are getting dark you can move them to the warming rack. The bacon will cause a bit of flames so you may need to turn the grill down a bit at first. 5. In the mean time, make the dressing and shred the cheese. 6. Add the tomatoes and romaine as you are taking the veggies off the grill. They only need about 2 minutes to be seared and you may want to turn the grill back up to Medium or so. 7. Once the vegetables, bacon and lettuce are removed from the grill, chop into smaller bite sized pieces and put dressing and cheese on top. 1. I’ve tried many variations of “dressing” for this salad, even just olive oil and salt tastes good. The best so far is mixing the pesto with a little more olive oil and balsamic vinegar tossing the salad with it. 2. Sprinkle with a little salt and shredded cheese and enjoy outside with friends and a beautiful view if possible! I love this salad for breakfast with poached eggs. It can also be made with seasoned chicken. Be creative and add what you'd like, avocado, pico de gallo, salsa and roasted bell peppers all make great additions! *Mix all these ingredients together in a jar with a tight fitting lid. Shake well to mix. You may also put them in a blender or food processor to mix. Add more spices or salt if needed to taste. Add more liquids if needed to thin. Allowing it to sit for a few minutes or even overnight mixes the flavors even more. 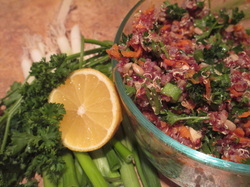 An easy to make high fiber and protein savory “salad” that is filling enough for a light meal. Feel free to omit or add what you like, experimenting with variations. A favorite variation of mine includes: lime instead of lemon, cilantro instead of parsley and cumin, avocado and black beans for a somewhat Mexican taste. This salad is also delicious with smoked salmon, cranberries, pecans and celery. 1. Place the minced garlic with the olive oil for the dressing in a small bowl or cup and let sit while quinoa cooks in next step. 2. Cook the Quinoa: Rinse the quinoa with warm water and drain through a fine strainer. Boil water in a large pot. Add salt and quinoa to boiling water. Boil 10-15 minutes (possibly a few minutes longer for red quinoa) until liquid evaporates and you see the little “wiry rings” separating from the grain (look closely if you’re not familiar with quinoa J). You may cool this before next step but you don’t need to. 3. Prepare the dressing: Mix all the dressing ingredients (including the oil and garlic infusion from step 1) and place in a large bowl. Add carrots, onions, seeds, and parsley. Add cooked quinoa (warm or cold) and toss. Serve at room temperature or chilled. Sometimes, I like to add the toasted sunflower seeds just before serving to keep them crunchy.